Over the years my personal research interests have focussed on the less tangible elements of the past, such as gender issues (Hurcombe 1995, Donald and Hurcombe 2000), perishable material culture (2014), and the sensory worlds of the past (2007a), but all of these have been underpinned by a longstanding appreciation of the role experimental archaeology can play as both a research tool and as an aid for public presentation (Hurcombe 2004, 2007b, Ch 4, 2008; Van de Noort et al. 2014). The OpenArch project (a five-year cultural project funded by the EU) has given me the opportunity to establish a close working relationship with those presenting the past in archaeological open-air museums. 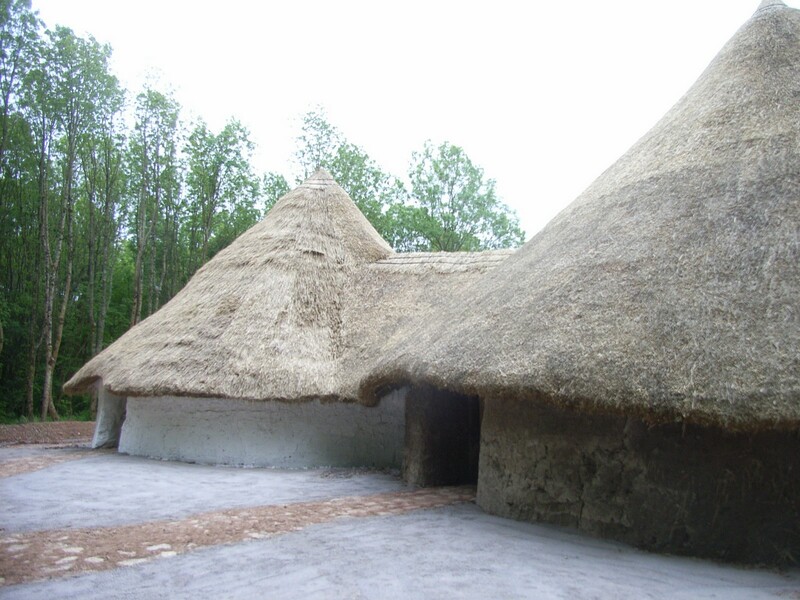 Exeter is the only University in the partnership which is formed from nine other partners from a diverse cross-section of open air museums, and the eleventh partner is the organisation EXARC. This has placed me in a unique position as an academic researcher. I have been able to build on my own research interests in this sector and we have had many interesting discussions arising from this interaction. This paper articulates a fundamental aspect of research and open-air museums: the relationship between tangible and intangible knowledge. Ever since first visiting open air museums as a student the value and unique position of such museums has been clear to me: they have to present intangible knowledge, making it tangible: they have to deal with the unknown as well as the known. This is both their unique contribution and their dilemma. There is an English saying “four walls don’t make a home”. The key point of this article has been to show that most AOAMs take interpretive steps which do indeed go from ‘walls’, to ‘house’, to ‘home’. Professional fieldworkers, academics and museum curators all make a contribution to the factual basis and its interpretation, but it is in the AOAM where this interpretation is given its fullest life. Archaeological Open-air Museums (AOAMs) communicate the past to the public, and many such museums achieve this entirely with replicas and reconstructions. To do this they have to fill in the gaps in knowledge and render the intangible tangible. The first issue is the problem I have termed “the missing majority” (Hurcombe 2014). Perishable material culture does not often survive in the archaeological record and yet, in life, it would form the majority of the societies’ material culture and would be used to express individual and group identities. The second issue is that some of the most interesting aspects of social and cultural life such as human behaviours, gender roles, social organisation, rituals and beliefs, music and performance, may leave little specific evidence. Archaeological research, traditional museums and AOAMs all play an important role in the formation of tangible and intangible knowledge but they make different contributions. Archaeologists deal with evidence and they present this in research reports where the facts can be put together to offer interpretations: what is known can be clearly separated from interpretation. In museums, the tangible artefacts can be labelled with factual information while more expansive statements and images can offer interpretations which augment the displays. These museums sometimes deal with unknown elements such as presenting an implement known only from one element as a composite reconstruction. An example would be presenting a flint arrowhead as a hafted and fletched arrow via a reconstruction or image. The traditional museum can present more wide-ranging social contexts and activities via artist’s reconstructions. An example might be an image of a funeral scene partly based on the placement of the finds and skeleton within an excavated grave but where the mourners and rites are partly imagined. Archaeologists and traditional museums thus present the tangible hard evidence as their primary concern with a layer of interpretation that is readily identified. In direct contrast, the AOAMs present a great deal of the intangible and interpretative material resting on a base of factual evidence which may not be present on site. This is their unique dilemma: they have to present the unknown augmented by the known, because a house without a roof is not functional: an unhafted arrowhead is meaningless within a quiver. It is a dilemma that AOAMs have made uniquely their own. The best museums rise to this challenge and do so in ways that contribute to the totality of archaeological knowledge, because they both present and produce evidence drawing from and contributing to experimental archaeology. The following discussion identifies some of the issues around tangible and intangible knowledge. It is a fallacy to think that experimental archaeology deals only with artefacts, structures, technologies and practical issues. Producing food and material culture require effort, knowledge and relevant craft skills and these may need to be deployed in cooperation with others, in particular locations, or at particular times of the year. An AOAM offers an opportunity to engage with the social as well as the practical and to appreciate the effort and expertise of individuals within past societies. OpenArch has recognised the need to engage the visitor in the expertise and sophistication of craft skills by producing a publication on this theme (Kelm 2015) and by also exploring how modern presenters working at the museums can themselves learn these skills via a series of small workshops taken out into a series of ‘Exeter Dialogue with Science Roadshow’ events over the course of 2015 (see the three Exeter Dialogue with Science Workshop 4 Learning craft skills events on hideworking, flintknapping, and basketry and related plant management and the ten Exeter Dialogue with Science Roadshow events (St Fagans (WAL), Foteviken (SE), Sagnlandet Lejre (DK), AÖZA - Hamburg students week (DE), Ancient Technology Centre (UK), AFM Oerlinghausen Museum (DE), AÖZA - Mesolithic Living (DE), Calafell (CAT), Archeon (NL) and Hunebedcentrum (NL)). The ability to show visitors skills and knowledge is a crucial aspect of the training needs identified by the management teams within OpenArch. Experience, experiment, and presentation are all interwoven with tangible and intangible aspects of the past. The agenda for the museum is to invite the visitor to explore this richly-textured reconstruction of the past society so craft skills and the effort to collect and process resources become part of the dialogue with the visitor. The archaeologists know that there are many elements of reasoned guesswork or even ‘best guess’ but the visitor sees only what is presented and as this is tangible this can be taken as the only possible reconstruction. Often visitors themselves open this dialogue by asking staff about what can and cannot be known. This is the other side of the unique dilemma of presenting the unknown: the responsibility to offer a dialogue with the visitor on the underlying evidence base. When a house is built, or when an activity is demonstrated or performed, the intangible knowledge is rendered tangible to the visitor. This is real today, so the visitor assumes the present day reality is as it was in the past when in fact there are layers of interpretation in between. The best AOAMs explain what is known and what is reasonably assumed via dialogue, information panels, or on-site museums. Some also deal with the science behind the reconstructions by presenting the methodologies of archaeological research. A great example of this takes place at the Parco Archeologico e Museo all’Aperto della Terramara di Montale, Italy, where school children first excavate, then identify and research the finds (Pulini and Zanasi 2009). This excavation experience is featured in other AOAMs but not all take the extra step of showing the process of researching the excavated finds. The process of generating archaeological knowledge is an intangible aspect of the discipline which this simple exercise explains and demonstrates in a tangible way. Often the specific steps of research and interpretation are complex and impossible for museums to present fully to the visitor. This is because as the intangible is rendered tangible, there are layers of interpretation. Reconstructed buildings, such as houses, and artefacts, such as knives, are a common feature of AOAMs and offer a familiar way of expressing this approach via worked examples as shown in Table 1. The approach can also be simply expressed as ‘groundplan ðwalls ðhouse ðhome ðliving home’. There are multiple lines of evidence and then four steps of interpretation possible in AOAMs. Openarch has placed buildings and structures as a key aspect of these kinds of museums (see Hurcombe and Cunningham in press) and tools and crafts have provided another pivotal set of discussions (Kelm 2015) so Table 1 has taken these two aspects and worked through examples of the interpretation steps. The evidence base may consist of excavated groundplans (such as houses) and artefacts (such as stone or metal blades), and for later periods there may also be helpful image sources or written sources. The first step is to take direct archaeological evidence and interpret it as tangible reality. As the steps of interpretation are taken the tangible evidence is augmented by drawing on other sources. These are not just from within the disciplines of archaeology and history, because ethnographic evidence is often used to suggest possible solutions for how an above ground structure might look and from what materials it might be made. Engineering and many practical constraints are drawn into designs to make sure that the buildings stand up, and that the tool angle and hafting system works. Ecological evidence is used to suggest materials available in the local environment during the period being shown. The house at ground level may have straightforward direct evidence of stone walls or the species of wood and size of the posts, but in many cases even the species of wood must be a reasoned guess. It will take indirect evidence from many sources to make a feasible reconstruction for the past environmental conditions. The house with walls and roof may need specific technologies and materials to be considered alongside design features to carry the weight of the roof effectively and design details such as the height and slope of the roof may need careful thought. For a house, a way of dealing with extreme weather (strong winds, intense rain, flooding), has often needed to be found alongside everyday issues such as warmth, light, airflow and smoke movement. To engage in these steps of interpretation the museum may make use of tangible archaeological evidence from other periods in the same region, or other regions in the same period, as they try to take the patchy archaeological evidence and make it into a more holistic working interpretation by filling in the gaps in the specific reconstruction. In any one house or hafted tool reconstruction there will be a wealth of such reasoned argument and often experimentation to find practical solutions. Several alternative possibilities may be shown. The dialogue with the visitor can often be prompted by showing more than one version. In St Fagans the recent house reconstruction has two slightly different roof thatching techniques (Burrow 2015). Even once a house is a standing building there are more interpretive steps. How is the space used? Where do people sleep? What tools and materials will be stored or used in it and where? Who lives in the house? These are such straightforward questions to which there may be no direct archaeological answers. Yet to leave the house bare is to give a minimalist view of the sophistication of the living conditions in the past. Many of the OpenArch discussions have focussed on the need to convey to the visitor the comfort and complexity of life in the past and many directors express an obligation to ‘do justice’ to the past within the reconstructions they present. Meller (2005) has written on the need to put objects in houses rather than leave them bare and Klompmaker (2015) has outlined an empathic approach within AOAMs. In all these cases, the key issue is that visitors are tacitly being asked to imagine these houses and artefacts in life. Direct and indirect evidence is used to ‘dress’ the house with the placement of artefacts within it offering an interpretation, but also a ‘staging’. The visitor coming into such a building can more easily imagine the house ‘in life’. In some cases the museum staff are in character within the buildings and the whole set of structures and artefacts collectively acts as a backdrop or staging for a direct interaction with the visitor. This dialogue and richly-textured understanding can be furthered by allowing people to live in the buildings. Here it is possible to have a three-way interaction between the museum staff, the visitors, and the people living in the houses where the tacit question of ‘where would people sleep?’ along with many other questions has to be answered by those living in the building. Not every museum offers this extra step, but where this is part of the way the museum works, there is another way of exploring the functionality of the buildings and they are given a more lived in feel where many aspects of artefacts, tasks, and life come together. This is yet another layer of interpretation and offers information on the performance of tools, cooking vessels, storage needs, smoke management and many other practical issues as integrated living systems come together. All these aspects can be fed back into archaeological interpretations. In some museums there are skilled crafts people on staff or present as part of ‘living experiences’ events such as the Viking market at Foteviken. These bring people together with relevant craft skills in a modern community of practice. They can share knowledge and expertise and trade their goods. At AOZA, the week of experiments by students from the University of Hamburg directed by Tosca Friedrich and Birte Meller, offered many tangible and intangible opportunities for experiments and these were as diverse as weaving cloth on a warp weighted loom and trying out recipes for hair treatments. At the same time Exeter University students were also involved in passing on the skills they had learned during their work in the one-year MA in Experimental Archaeology, and these students also benefitted from opportunities for furthering their own dissertations and research in tangible and intangible heritage. The process of presenting information to visitors and to other students offered the chance for skills enhanced during Exeter’s Learning craft skills series of workshops to be passed on to others created a ripple effect. Thinking about the methods of passing on practical knowledge was certainly relevant to the intangible knowledge presented by staff and volunteers to the visitors, and also pertinent to ways of thinking about tacit and explicit knowledge in the past. The whole effect was to ask new questions of the intangible aspects of culture in the past. Museums where crafts are practiced in front of visitors offer the chance to experience practices unfamiliar in the modern world. 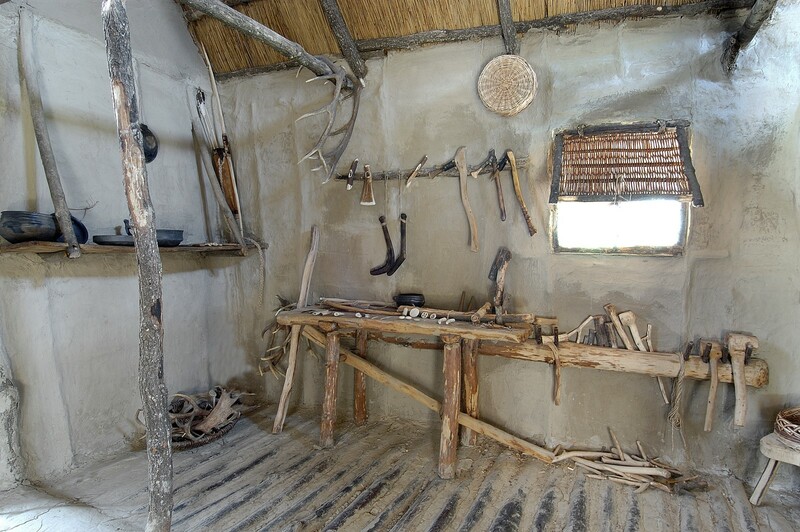 Flintknapping, processing flax, spinning wool or using a warp weighted loom are all rarely seen. 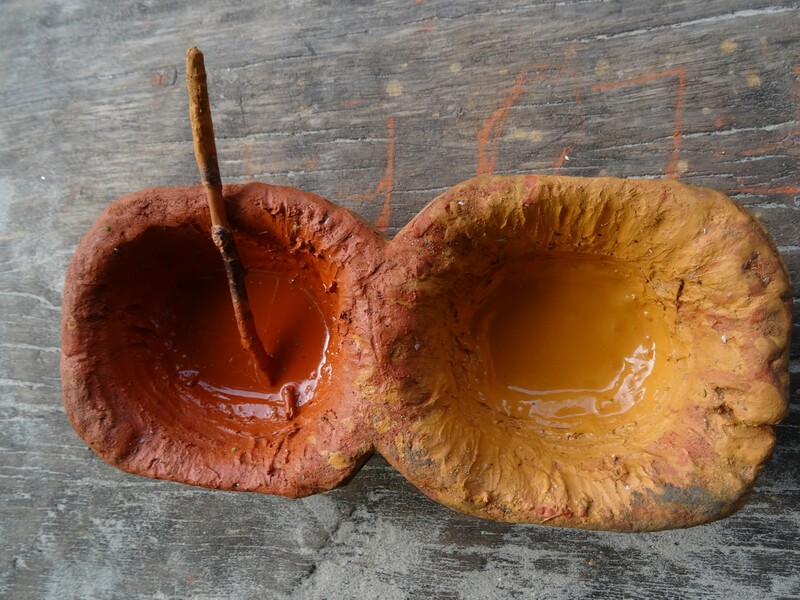 Furthermore, these crafts in action offer sights, smells and sounds giving a small taste of the sensory world of past societies. Smells and cooking styles are strong cultural traditions in modern communities. Presenting past cooking traditions can be a challenge. There is often some direct archaeological evidence for what foodstuffs are consumed and how these might be cooked but no words are as effective as the smell of a stew pot or the direct taste of simple bread freshly baked. A fish with some herbs, wrapped in leaves, emerging from the cooking pit, or cooked on a plank beside the fire, or small strips of meat cut with a stone knife and placed on a hot rock near the fire all enable the visitor to see unfamiliar cooking methods, simplicity or sophistication, and the enjoyment of foods that were possible in the past. Pleasure and taste are other important intangible aspects of life in the past. Thanks to David Lundqvist and Karin Stålberg, the cooking at the Athra Stone Age gathering at Sagnlandet Lejre in 2015 gave visitors, staff and the participants of the Stone Age gathering a chance to think about diverse cooking methods and how food in the Stone Age might have tasted. 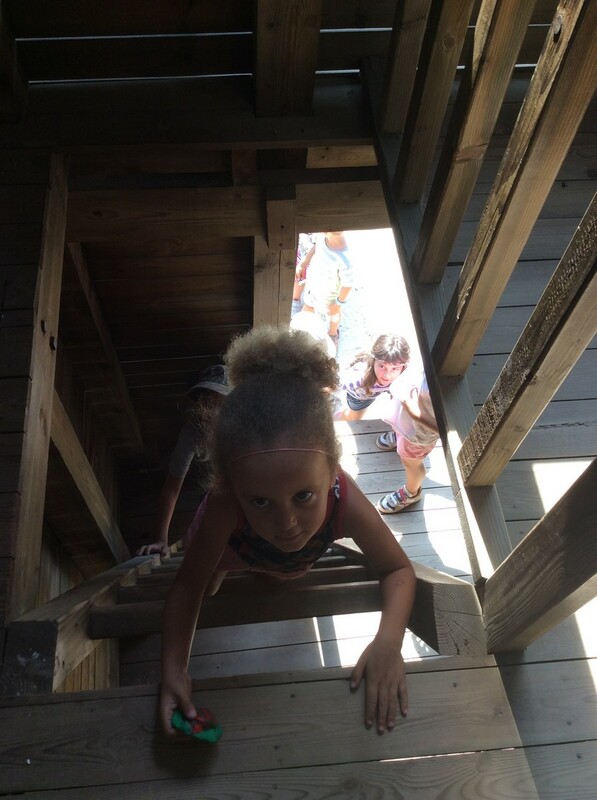 Centres which have modern families living in the reconstructed buildings, even for short periods of time offer visitors a rarity–the chance to see tangible evidence of how children might have been incorporated into the tasks and daily life of the period and how these skills might be learnt. 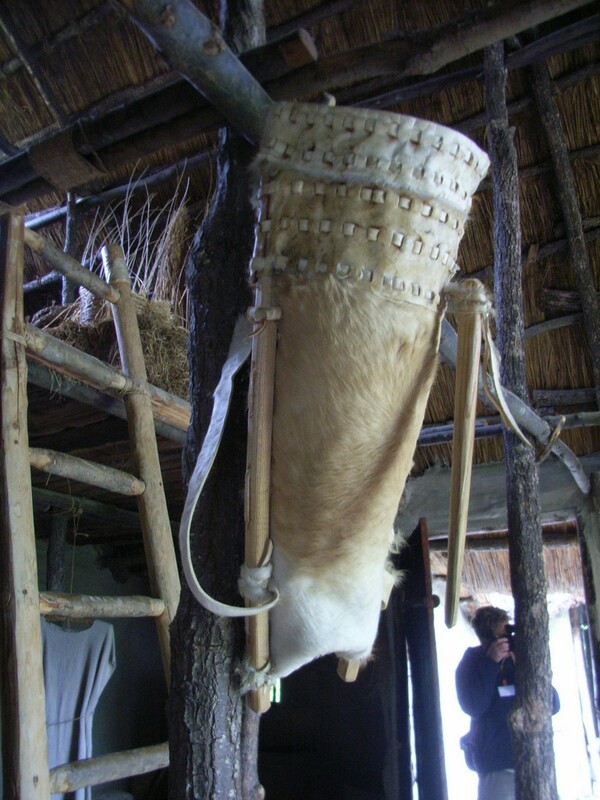 These opportunities can be as simple as the suspended cradle in a ‘Viking’ tent in Foteviken, and the children practicing archery in Kierriki and many other AOAMs which show the social importance of learning essential skills. At Kierikki the museum has recently produced a film which has taken on the issue of adversity within a prehistoric society (Markkula 2012). The film shows a child experiencing loss but also a community reacting to the need to obtain food and deal with death. 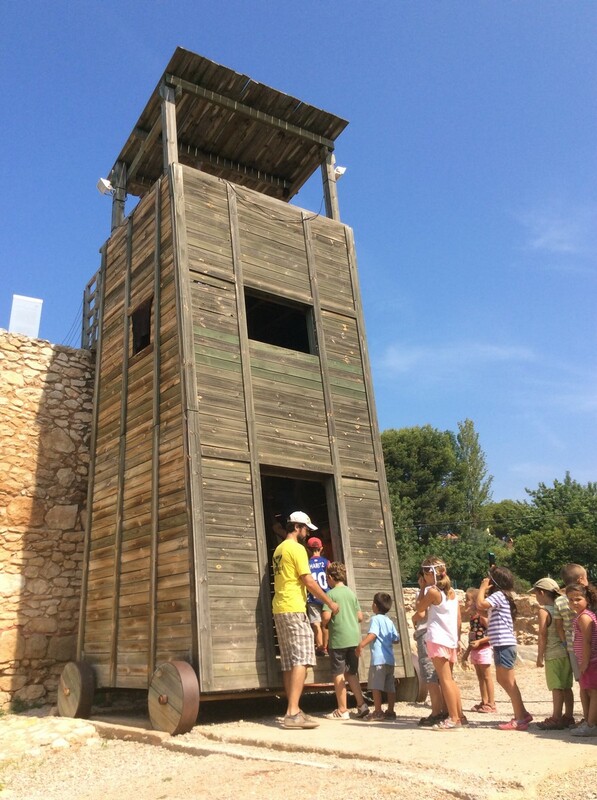 Warfare is also dealt with in an educational way at Calafell where the mobile siege tower which in the past allowed attackers to scale strong walls is now a novel experience and exciting way to enter the building for schoolchildren visiting the site. Though different roles are now given to this structure, it nonetheless makes the children understand the need for security and defence and allows them to think about the vulnerability of people in the past to attack. When archaeologists think of rituals, beliefs and performances, these can be readily identified as intangible. Some AOAMs have performances such as the theatrical gladiator show and now also a Boudicca show in the recreated amphitheatre at Archeon (Hogendoorn 2015), or the performance of an opera in the modern amphitheatre built directly over the Roman one at the extensive Roman city of Viminacium. Both are modern performances but they invite the visitor to think about the Roman amphitheatres of the past as arenas for performances. It may be impossible to know exactly what performances and rituals were associated with a particular period but there is often some kind of evidence as a starting point. The work of some archaeologists at an AOAM has addressed cosmologies as an aspect of Bronze Age burial practices amongst many other issues of the past (Breuning-Madsen et al. 2001, 2003, Rasmussen 2001). Evidence such as Palaeolithic cave art or decorated Mesolithic artefacts may not reveal the specific beliefs but the visitor can be invited to consider this evidence as an open question. Near the important Palaeolithic site of Atapuerca, Spain, there is an open air park where visitors can make a hand stencil on an artificial ‘cave wall’ and in Archeon’s Mesolithic area two bowls of red and yellow ochre sit in an open invitation to paint yourself. Sometimes it does not matter that the archaeologists do not know the definitive aspects of the belief and ritual because to simply raise the question in the visitor’s mind is enough to ensure that the visitor leaves with an appreciation of the sophistication of the past society and also an awareness that some questions remain unanswered. There is an English saying “four walls don’t make a home”. The key point of this article has been to show that most AOAMs take interpretive steps which do indeed go from ‘walls’, to ‘house’, to ‘home’. Professional fieldworkers, academics and museum curators all make a contribution to the factual basis and its interpretation, but it is in the AOAM where this interpretation is given its fullest life. The best open air museums make educated guesses and put multidisciplinary information together to deal with all the missing perishable intangible data. In addition, they also try to offer a social context and can choose to deal with the higher forms of intangibility by offering tangible prompts for visitors to think about issues such as rituals and beliefs even if these cannot be known specifically. Some museums also let people use their buildings so that there is a living social context. In each of the interpretive steps there are also ways in which the dialogue with science can be enhanced so that new ideas and data can inform archaeological research. At every level the dialogue with science can interact in this complex and unique contribution allowing open air museums to contribute to the generation of knowledge. The relationship between tangible and intangible heritage addressed so directly by the museums can lead to another important interaction with science -new questions being asked of existing data. Some of these questions also focus on the least tangible aspects of the past. Though dealing so much with intangible knowledge is a dilemma, it is also the unique and important contribution of open air museums. Table 1. The interpretive steps of presenting tangible and intangible evidence worked as two examples for a structure (house) and an artefact (knife). Linda Hurcombe set up the MA in Experimental Archaeology, Dept. of Archaeology, University of Exeter. BREUNING-MADSEN, H., HOLST, M.K. and RASMUSSEN, M., 2001. The Chemical Environment in a Burial Mound Shortly after Construction—An Archaeological–Pedological Experiment., Journal of Archaeological Science, 28(7): pp.691-697. BREUNING-MADSEN, H., HOLST, M.K., RASMUSSEN, M. and ELBERLING, B., 2003. Preservation within log coffins before and after barrow construction., Journal of Archaeological Science, 30(3): pp.343-350. DONALD, M. and HURCOMBE, L., (eds.) 2000. Gender and Material Culture. (3 volume series), London: Macmillan. HURCOMBE, L., 1995. Our own engendered species, Antiquity, 69: pp. 87-100. HURCOMBE, L., 2004. Experimental Archaeology. in Renfrew, C. and Bahn, P. (eds.) Archaeology: The Key Concepts London: Routledge, pp. 110-115. HURCOMBE, L. 2007a . A sense of materials and sensory perception in concepts of materiality, World Archaeology, 39(4): pp. 532-545. HURCOMBE, L. 2007b. Archaeological Artefacts as Material Culture. London: Routledge. HURCOMBE, L. 2008. Organics from inorganics: using experimental archaeology as a research tool for studying perishable material culture. World Archaeology, 40(1): pp. 83-115. HURCOMBE, L., 2014. Perishable Material Culture in Prehistory: investigating the missing majority. London: Routledge. HURCOMBE, L. and Cunningham, P., (eds.) in press An object Biography Approach to Structures in Experimental Archaeology. Leiden: Sidestone press. KELM, R., (ed.) 2015. Archaeology and Crafts: Experiences and Experiments on Traditional Skills and Handicrafts in Archaeological Open Air Museums. Albersdorfer Forschungen zur Archäologie und Umweltgeschichte Band 5, Archäologisch Ökologisches Zentrum Albersdorf, Husum, pp. 162-177. KLOMPMAKER, H., 2015. Profiling an era – the concept of empathic archaeology, Archaeology and Crafts: Experiences and Experiments on Traditional Skills and Handicrafts in Archaeological Open Air Museums. Albersdorfer Forschungen zur Archäologie und Umweltgeschichte Band 5, Archäologisch Ökologisches Zentrum Albersdorf, Husum, pp. 162-177. MARKKULA, P., 2012. Sun Stone / Aurinkokivi. One year survival in difficult Stone Age conditions. DVD 16 minutes. Oulu: Kierikki Stone Age Centre. MELLER, B., 2005. Von Grundbedürfnis und Mutmasslicher Notwendigkeit, in Kelm, R. (ed.) Frühe Kulturlandschaften in Europa: Forschung, Erhaltung, und Nutzung. Albersdorfer Forschungen zur Archäologie und Umweltgeschichte Band 3. Archäologisch Ökologisches Zentrum Albersdorf, Husum, pp. 140-149. RASMUSSEN, M., 2001. 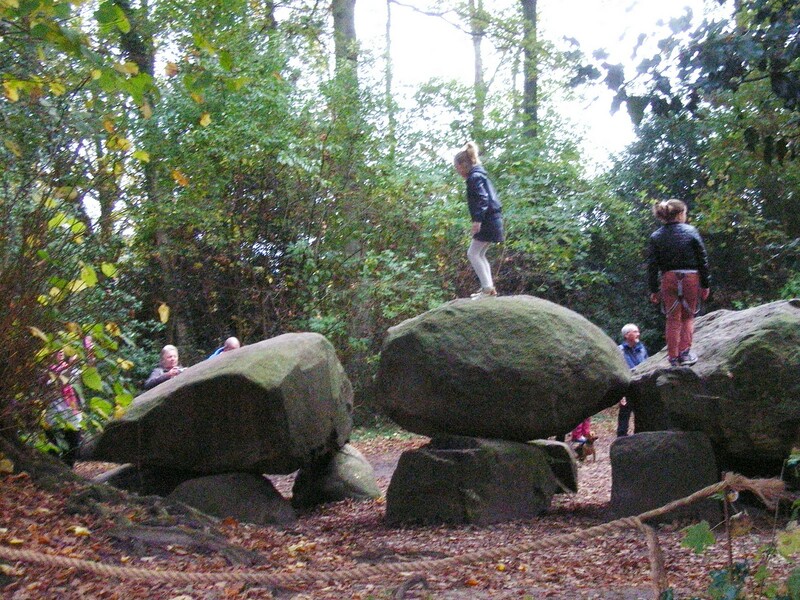 Experiments in archaeology : a view form Lejre, an "old" experimental centre. Zeitschrift für schweizerische Archäologie und Kunstgeschichte(Journal of Swiss archeology and art history): 58: pp. 3-10. Van de NOORT, R., B. CUMBY, L. BLUE, A.F.HARDING, L. HURCOMBE, T. MONRAD HANSEN, A. WETHERALT, J. WITTAMORE, A. and WYKES, J., 2014. Morgawr: an experimental Bronze Age-type sewn plank craft based on the ferriby boats, International Journal of Nautical Archaeology 43(2): 1-22.